I wanted to smoke some pulled pork but the weather super stars said we were in for some snow this weekend here in Delaware. Guess what? thats right the weather was beautiful. then a man must smoke. Smoked a fatty on Saturday. Fresh, hot sausage stuffed with spinach, mushrooms, onion and cheese and wrapped in bacon. Made up about a dozen jalapeno poppers on the smoker, too. Hey guys...it's been a while! Lots of fun catching up on the thread. I've been on a goat kick the past year or so...soooo tasty! Did you hit a dog, Luke?? brave the goat/mutton barrier one day. You should try it out Brad...I just do salt and olive oil...couple of hours on the smoke...couple of hours in foil...perfecto! I have a local butcher that slaughters about 100 goat a week and I've always wanted to try it. My dad suggested years ago that I cook one. He has since passed and I still haven't done it. Now I can't wait. Couple questions. So do you keep this low and slow the whole time and do you take it to 165 or 190? How big of a goat is that dog, ehhhem, goat you have there? Do you prefer any specific smoke? They are young goats and are about 8 lbs for a side. The pit is at normal smoking temp...220ish. I don't take the temp on the meat...just smoke it for 2 or 3 hours then foil it for another couple. Once it is sealed in the foil you can't go wrong...it is very forgiving. I may even throw a dash of beer in the foil when I seal it up for extra moist deliciousness. I've used oak, hickory, apple, mesquite...all with success. 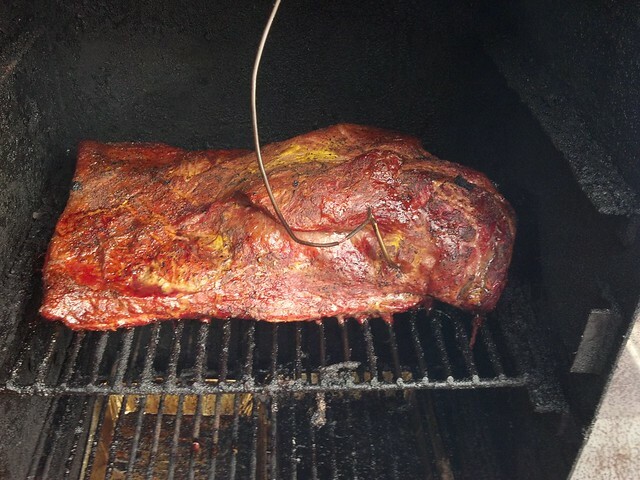 If you are using mesquite or something heavy like that you may want to keep the smoking time closer to 2 hours. It's a fairly delicate flavor and you don't want to overwhelm it too much. Do it up...you won't be sorry. Make some cabrito tacos! Corn tortilla, lime, cilantro...mmmm! Smoked a couple pounds of pork loin on my grill tonight for dinner. Enjoying the 70* weather in MN. I got an apple tree in my yard that I cut chunks off of to smoke with. One of the main branches died and I cut it out and take my chips from the stump. Soak them for a while in water and put them right on the burner. Works pretty good. I put the loin in foil with a little apple juice for the last hour. Turned out great, juicy and fork tender. Picked up a 7-bone chuck on Saturday, coated it with a cayenne chili rub and smoked it Sunday with plum wood. Nice looking chuckie Adam. Those are one of my absolute favorites!! That's where the flavor is. That chuckie looks delicious! It's still on my list of things to BBQ. 75 degree weather all week, on vacation = time to fire up the smoker. 15lb brisket, this is the my families favorite. That briskett looks awesome Jeff. I haven't smoked one since Christmas and it was an overwhelming success. My new favorite. I do have to say I am now intrigued by the Chuck roast. Never done one, but that too looks incredible. Thanks and let us know how your briskett turned out.